Mahanagar Telephone Nigam Limited (MTNL) offers more than 10 Unlimited Broadband Plans offering speed of up to 8 Mbps for its both as well new customers in the capital city of Delhi. Not only Unlimited Data at 8 Mbps speeds, MTNL Delhi also offers Unlimited Calls to either MTNL network or All network depending upon the plan. Freedom ULD-1299 1299 up to 8 Mbps 512 kbps 150 GB 1 Mbps Unlimited free Local calls on all network including MTNL Mumbai network. Speeds after Fair Usage Policy are reduced to 1 Mbps in Freedom ULD-699, Freedom ULD-849, Freedom ULD-999, Freedom ULD-1099, Freedom ULD-1299, Freedom ULD-1449 and Freedom ULD-1999. Speeds after Fair Usage Policy are reduced to 2 Mbps in Freedom ULD-2299-Combo. Upload Speeds are 512 kbps in Freedom ULD-699, Freedom ULD-849, Freedom ULD-999, Freedom ULD-1099 and Freedom ULD-1299. Upload Speeds are 768 kbps in Freedom ULD-1449 and Freedom ULD-1999. 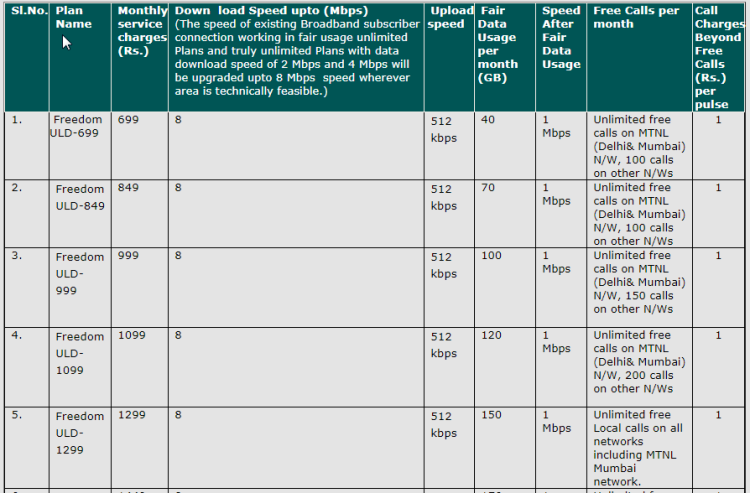 Upload Speeds are 1 Mbps kbps in Freedom ULD-2299-Combo, TriB UL data-3499 combo and TriB UL Data-3999 Combo. MTNL offers Unlimited Local & STD calls on all networks in Freedom ULD-1999, Freedom ULD-2299-Combo, TriB UL data-3499 combo and TriB UL Data-3999 Combo. MTNL offers Unlimited free Local calls on all networks including MTNL Mumbai network in Freedom ULD-1299 and Freedom ULD-1449. MTNL offers Unlimited free calls on MTNL (Delhi & Mumbai) and 100 calls on other network in Freedom ULD-699 and Freedom ULD-849. Please Note : The speed of existing Broadband subscriber connection working in fair usage unlimited Plans and truly unlimited Plans with data download speed of 2 Mbps and 4 Mbps will be upgraded up to 8 Mbps speed wherever area is technically feasible. In case any one of you is interested in getting these plans, you can dial 1500 from the MTNL Mobile or landline or SMS MTNL to 9868552121.